An old joke: Two trains pull in to Warsaw Central Station; one of them is the westbound Moscow-Paris express, the other is the return train from Paris, heading in the opposite directon. 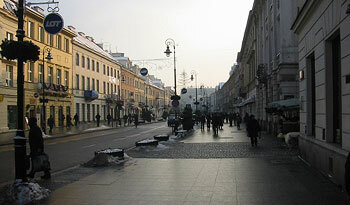 A Frenchman steps out of eastbound train, thinking that he's reached the terminus, and walks out into downtown Warsaw. What he sees roots him to the spot. "My god, the filth! The poverty! Look at these monstrous buildings, the ratty little cars, the clouds of black smoke - look at the people standing in line, in such cheap clothes - the shelves bare in every store! Moscow is every bit as desolate as I expected!" Meanwhile, a Russian gets out the westbound train, takes one look around and cries "Ah, que c'est beau, Paris!" As with so many things in life, you will get much, much more out of a visit to Warsaw if you take appropriate care to minimize your expectations. A backpacker freshly arrived from Prague, Stockholm, or (God forbid) Paris might feel an understandable sense of panic wandering into the raspberry confection we call Okęcie International Airport, or taking the first few slushy steps out of Warsaw Central Station into the ugly building contest we call downtown. But by simply adopting the Polish national motto ("it could always get worse"), the prudent visitor can inoculate himself against all manner of disappointment. And after a couple of donuts, a bus ride or two on the scarily modern new coaches that wish you a happy name day in glowing LEDs, and a few strategically timed glasses of hot spiced wine, Warsaw will start to acquire a happy, rosy glow. The saving grace of the city is that there are any number of interesting nooks and crannies worth exploring. And once you leave the heart of downtown, the entire stretch along the Vistula is genuinely beautiful, from the Citadel through the Old Town, all the way down to Łazienki park and south to the old royal residence at Wilanów (e.g., ville neuve). Warsaw University lies right in the middle of the New Town (like every New Town in Europe, one of the oldest parts of the city), and masses of students help keep the city alive, awake, and interesting. And because this is Eastern Europe, the national capital naturally lives serious cut above the rest of the country, with a pleasing whiff of cosmopolitanism that you won't find in, say, Grzęzidło Dolnośląskie. There are even hipsters now - a whole posh row of trendy cafs and restaurants tucked in behind the Aleje Jerozolimskie - so that the smug Americanized expat no longer feels like he is at the top of the coolness pyramid. When the summer months come, and constant darkness gives way to the beautiful late nights of June, it is hard to be unhappy in Warsaw. The locals manage, mind you - dissatisfaction is a natural sport - but it takes hard concerted effort, and a good helping dose of misgovernment, one of the few things that has never been in short supply. I was born and very slightly raised on the western side of the city, in a district known as Ochota. You would not have recognized me back then - I was a little blond kid, spoke no English, and had a lively interest in automotive trivia that has disappeared as completely as the blond hair. Warsaw was somewhat slim pickings for an automotive buff in the late 1970's - there weren't many cars on the roads, and what there were tended to be unimpressive socialist putt-putts - but I perservered and had pretty much the whole line of Eastern Bloc models memorized by the time we left for America, that automotive paradise. My other interests at the time involved rocketry (specifically, pretending to be a pilot steering the carcass of my prone sleeping father), ham sandwiches (rationed! ), and elaborating complicated and probably workable plans for how to trap a street pigeon in a shoebox and take it home to be my pet. My parents' apartment wasn't far from the Central Station referenced in the joke. It overlooked a middle school playground - a good place to play badminton with my grandmother, but also home to fierce tribes of giant older children that I found terribly intimidating. There was a grocery store across the street, a playground not far from the back entrance, and a set of parallel bars in the courtyard where every Saturday you could hear the rhythmic thwack! thwack! thwack! of women beating the dust out a defenseless carpet. My closest brush with the yoke of totalitarian rule was at the state preschool, where I was forced to wear scratchy wool tights and eat foul foods like rice with apples by a certain Miss Lusia. The Warsaw skyline of my childhood consisted of exactly one building - the Palace of Culture and Science, the ultimate in unreturnable gifts, built for the grateful inhabitants of Warsaw by our fraternal allies to the east. The Palace is an oppressive sixty-story erection of cheap sandstone in the architecural style known as Stalinist Gothic, or Stalinist Wedding Cake. In the total absence of other tall buildings, the Palace quickly became an icon of the city, squatting on an immense open square with inspirational Orwell-in-toga statuary of workers' heroes arranged in niches around its base. It may not have been completely original (Moscow has eight of the things), but it was definitely memorable in its ugliness, and a good place to catch a concert. There was a moment in the immediate aftermath of 1989 when the Palace's fate was uncertain, so it's pleasing to see that it survived the initial backlash and is still standing, alive and well. It is beginning to assume a campy, retro-socialist feel, and irony becomes it. When I made my first trip back to Poland in 1990, the Palace was still rather filthy and unlit, except for a giant floodlit billboard towards its spire (symbolic of the glued-on capitalism of those years). Later in the 1990's, it seemed to be falling into disrepair - the plaza at its base turned into a permanent bazaar, and for a happy few years, two of the neon lights in the theater lobby marquee stayed broken, so that instead of spelling out "Palace of Culture", at night they brightly shone with the words "Palace of the Cult". But now the Palace has been scrubbed, ornamented with a nice bright set of lights, and generally made to look like a respectable citizen of the urban landscape. At least after dark. It helps that the Palace is no longer the only high-rise in the entire capital. There was a little building boom in the 1990's, during which architects seemed intent on proving that capitalism could build things just as hideous as socialism had, and do it in a tenth of the time. So in the space of the decade, the city acquired a little patch of provincial skyscrapers, each one designed in five minutes on a blank sheet of graph paper, and each one clad in reflective glass to better mirror all the others. The net effect has been more glory for the Palace, which at least now has a crowd to stand out from, and mercifully absorbs most incident light. Like so many things in life, responsibility for Warsaw's architectural trouble rests squarely with the Germans. Not only did they design much of what went up in the 1990's, but they were responsible for setting the city up with so much vacant land to begin with. To say the city had a rough time of it during the war would be putting it mildly. Warsaw effectively ceased to exist, going from a bustling capital of 1,300,000 on the eve of the fighting to an uninhabited expanse of ruins when the Red Army finally arrived. While the city was heavily damaged in the 1939 attack, and lost a whole section of its downtown during the liquidation of the Ghetto in 1943, the real destruction did not occur until August of 1944. That month marked the start of the Warsaw Uprising, a general insurrection that lated for three months, and ended with the city's entire population either killed or deported. The idea behind the uprising was to tie up German forces, speeding the advance of the rapidly approaching Red Army, as well as carve out some kind of official status and future political role for the underground Polish resistance before the Soviet armies took over completely. It was the largest resistance action fought during the war. Most of the soldiers in the underground Home Army were veterans with a vivid memory of the Soviet invasion in 1939, and most were aware that the Soviets had earlier executed the bulk of the Polish officer corps in Katyń Forest. So they had few illusions about their likelihood of ultimate success, even if they failed to anticipate the full extent of Stalin's cold-bloodedness. For Stalin, the Warsaw Uprising was an excellent opportunity to be rid of some troublesome political opponents. Although advance units of the Red Army were already in the eastern districts of Warsaw when the fighting began in August, they halted for almost five months, giving the Germans time to bring in thousands of SS troops to quell the revolt. It was a horribly bloody affair - all told, the city lost nearly two hundred thousand people, most of them civilians massacred in cold blood. Those left alive when the hostilities ended in November were deported or sent to labor camps in Germany, leaving the city completely empty. Hitler was so enraged at the insurrection that he ordered the methodical destruction of what remained of Warsaw, and the engineers sent in to accomplish the task were able to finish their work before the Russians finally crossed the river in January of 1945. Eighty-five percent of the city was razed. Because the destruction was so total, paradoxically there are few traces of the war left in Warsaw, far fewer than you might see in Kraków or Łódź. The only reminders are the several large public monuments, along with the innumerable, numbing plaques on nearly every street corner, indicating the number of civilians shot in reprisal killings on the spot on such and such a date. The numbers grow as the war progresses, the events the plaques describe impossibly remote even though the war remains in living memory. Poland voted to restore the capital in an otherwise dubious 1948 referendum that also brought in sweeping constitutional change. The decision to rebuild was not a simple one - the country had lost a third of its population and sustained damage estimated at 18 times the 1939 gross national product, so devoting the nation's resources to rebuilding the capital meant real sacrifice. There was some talk of moving the capital back to Kraków, or even rebuilding the city somewhere other than on a gigantic pile of ruins that would have to be cleared. Still, the reconstruction went ahead and proved to be one of the most genuinely popular actions by the newly-installed socialist government (the Red Army was kind enough to bring a Polish government with it, saving the trouble of having to fetch the old one all the way back from London). Postwar photographs and films of the capital show a lunar landscape - entire streets invisible under mountains of rubble - with long bucket brigades of people painstakingly clearing the debris and picking out unbroken bricks for reuse. Unlike the city of Rotterdam, which suffered similar devastation, it was decided to rebuild at least a part of Warsaw as it had been before the war, and so architects and planners meticulously collected old photographs, paintings, maps and other documentary evidence needed for a faithful re-creation. A series of 18th century cityscapes proved particularly useful. 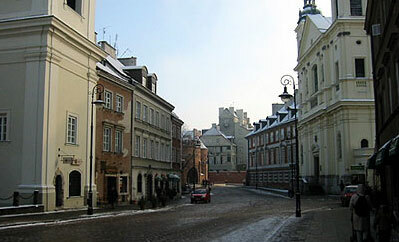 In the end, a large swath of the medieval Old Town and 18th-century New Town were rebuilt, making Warsaw a little bit like the joke about the 200 year old axe, where the handle has been replaced twice and the head three times. You find yourself walking through a four hundred year old square that was built all of fifty years ago. The Royal palace, with its sumptuous interiors and stately air of antiquity, was built a year before I was born. All the war statistics and numbers seem impossibly abstract. It's a jolt to think that only fifty years separate here from then. My grandfather, alive and well at 91, remembers it all, and every time I go back I try to note it down, imagine it through his eyes, and otherwise fix the unreachable past in my own memory. But strange, misplaced nostalgia is a symptom of emigrating too young, and I'm glad my own city is moving on. In five years it will be like any other second-string European capital, miraculously, gloriously normal. It makes me happy to see it.